Hey guys, spare a thought for those who are still waiting to receive them. You're making it even harder!! Boy would a McClicky pack on these be a great additional option. A PD pack would also be fantastic, if you see it as a doable addition to the design as it stands. I am going to have to get an aqMule eventually. That's exactly what Troy said last night. All four walls and the ceiling. Nice!! Brandon, fun chatting with you last night. I am certain you need an AquaMule. So just get one. No photos of the new addition to the family? PSM, Nice pic ! Thanks for sharing. My AquaRam arrived today and it doesn't disappoint with a typically "McGizmean" blend of form and function. Its an enhancement of the excellent 27LT, with the 4 levels replacing 2, the lowest level being more suitable for preserving night vision than it was on the 27LT and the highest level being much brighter thanks to the latest emitter, the XM-L2. The chunky battery tube with its tri-lateral flat cut-outs is great to look at as well as for gripping. Its also rock-solid for tail-standing and provides anti-roll into the bargain. This is an ingenious design. The beam is a nice balance of flood and throw similar to the 27LT. The XM-L2 does a surprisingly good job of providing some throw in a reflector whose smaller diameter (compared to the 27LT) would suggest mainly flood. Then there is the added reassurance of this being an officially approved dive-light by McGizmo himself, who is traditionally very cautious in handing out this type of designation. Although I will probably never use it for this purpose, it means that I'll have no qualms about taking it out in the severest of rainstorms, if necessary. So, all-in-all I'd rate it as McGizmo's most exciting and most all-round offering and an obligatory addition to any self-respecting flashaholic's armoury. Last edited by easilyled; 10-23-2013 at 04:33 AM. Thanks dmdrewitt. I'm sure that yours will not be much longer but the wait is very frustrating as I can testify. A well-written mini review of the AquaRam. I couldn't agree more: this is easily McGizmo's most "grip friendly" design and it's really a light meant to be seriously used without worry. This is a true "take it anywhere" light, built like an absolute tank, and ready to withstand years of hard usage. If you like the AquaRam you'll be blown away by the "Super Mule" (aka AquaMule). I call it the Super Mule because it's the Mule increased two fold. You'll love the four levels and the light-up-the-whole-room action. I love it so much I just ordered another! Thanks Troy. I'd certainly like the AquaMule too but I need to free some funds first. One at a time! One at a time!!! My Aqua Ram should be here on Thursday. Hopefully for some late night dog walking! Last edited by PoliceScannerMan; 10-23-2013 at 09:29 AM. Reason: Not AquaRam, AquaMule! Do you mean AquaMule? I thought you had already acquired an AquaRam. My favourite emitter would be the 5C1 4000K XM-L2 (T5 output bin, I believe). This has a really lovely orange-white tint with great color rendition, yet still has similar power output to the cool-whites. Yes Mule! Will edit my post, thanks! I definitely plan to come up with a High CRI AquaMule and although not specifically offered at this point, I can build an AquaMule with the Nichia 119V for someone who wants it. I have a prototype AquaMule that hosts two of the 119V in parallel. This is not ideal in terms of driving the LED's because their share of the current is based on their relative Vf's but since the 119V can handle 1400 mA on its own splitting that between a pair, even if unequal, is not approaching any red line. I might end up having a run of MCPCB's for paired 119V's made. I am confident there would be a gain in lumens from running two in parallel over a single LED driven at the same total current but I don't know if that gain would justify the added expense of custom MCPCB's and double the number of LED's. I would love to see a Cree XM-L High CRI LED but if its CCT is below 4500K then it's a yellow light to me and my aversion to yellow would make it a LED I personally don't care for and that's not something easy to get behind. In my opinion, The XM-L's I am presently working with are cool white in tint but still, white. Not blue. A 3500K LED is yellow to me and I don't care if it has a CRI of 100 which means it matches the spectrum of a yellowish incandescent lamp at 3500K. It's still yellow in my perception. It may be selfish on my part but I want to like what I offer and believe in what I offer. And realistically, I can only offer so much and at this point the range in components I have to fund and keep on hand is getting daunting. EDIT: The good news is that the Aqua Mule is certainly an easy light to modify. Last edited by McGizmo; 10-23-2013 at 11:24 AM. These CRI XM-L2's would probably look yellow to you Don, no worries! But to me, they are great, looks like warm Sunlight. 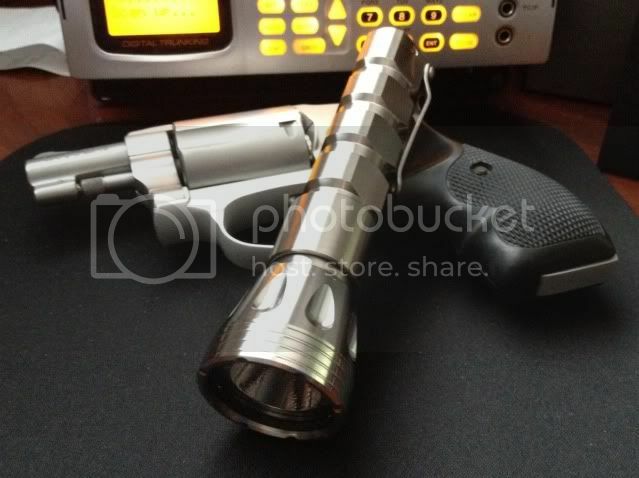 I have a 4 mode copper Mule from Nailbender with the CRI XM-L2 warm white 90cri S6 flux 7A2 tint. IMO warm mules are way more tolerable than a warm collimated light. The good news is that the Aqua Mule is certainly an easy light to modify. If it ain't broke don't fix it, is what I always say. Email sent for AquaRam and coil tether, thanks Don! I share Troy's sentiments,Its ABSOLUTELY AMAZING!! Last edited by Light11; 10-23-2013 at 08:06 PM. digging the teardrop head, beatiful light! Light11, you've made me change my order to an etched clip, it looks great The polished clip on the PD looks nice too. I have a prototype AquaMule that hosts two of the 119V in parallel. Have you toyed with the idea of a triple instead of a double? This is a great post, both in terms of an 'Aqua fix' and information too. For the record, I'm one who enjoys the warmer tinted emitters as long as they're in the creamy incandescent range, but my Nichia 119 Haiku is so perfectly white that it can satisfy even dyed in the wool warm tint fans. 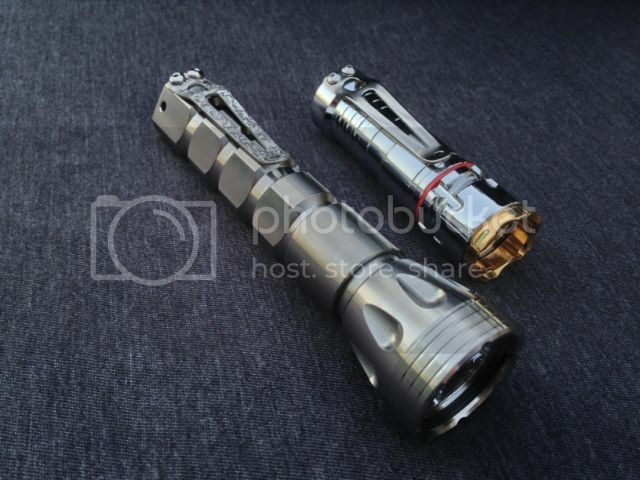 Love the idea of the dual-emitter Aqua Mule and look forward to seeing more on it as you get your prototypes finished and out with the turtles.